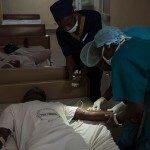 KUMASI, Ghana—A nurse warns, “He just vomited outside,” as John Obeng shuffles into the clinic, his limp body supported by two hospital staffers holding him up by the elbows. As soon as he slumps down in an examination chair, his head falls on the cushion. His eyes roll back into his head as he grimaces in pain. His left hand clenches the armrest, while his right one trembles. Agony grips his face. 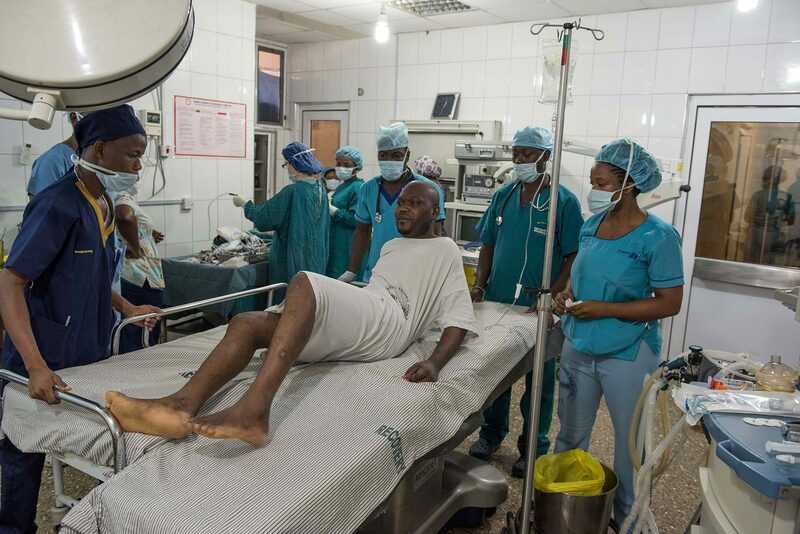 Dressed in dark slacks, a red-checked shirt and black loafers, Obeng is a regular patient at the Komfo Anokye Teaching Hospital, or KATH, in the West African nation of Ghana. He is a pharmacy technician who began experiencing dizzy spells three years ago. His latest attack of vertigo was so severe that he had to lie down on the concrete floor of the nurses’ staff room as he waited to see the doctors. This might be the luckiest day of Obeng’s life. 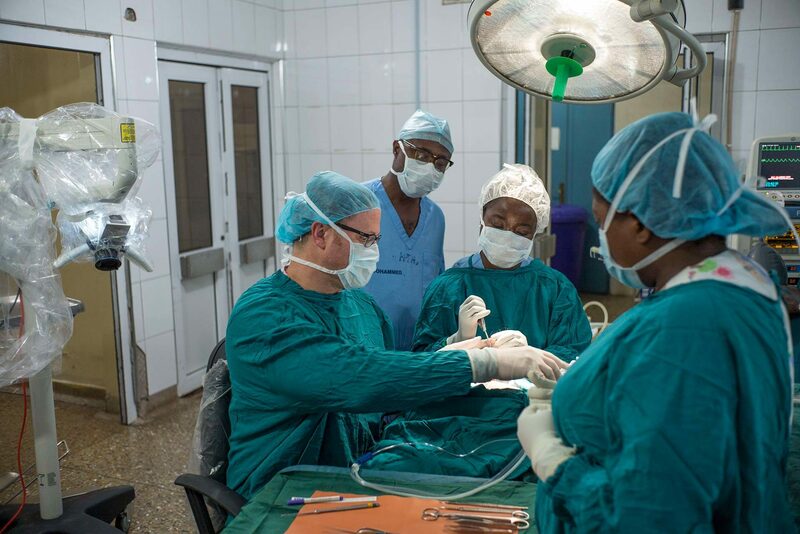 A group of University of Michigan Health System doctors is spending a week at the hospital doing training sessions with their Ghanaian colleagues. It’s part of a new collaboration between the two institutions’ departments of otolaryngology-head and neck surgery, also known as ENT—ear, nose and throat. 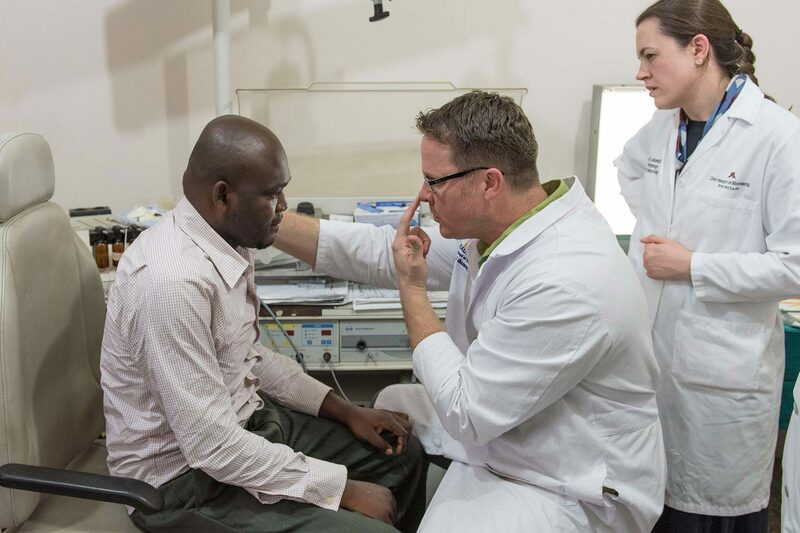 Chronic ear infections—often easily treated or prevented—are a widespread problem in Africa and can lead to disabling hearing loss. 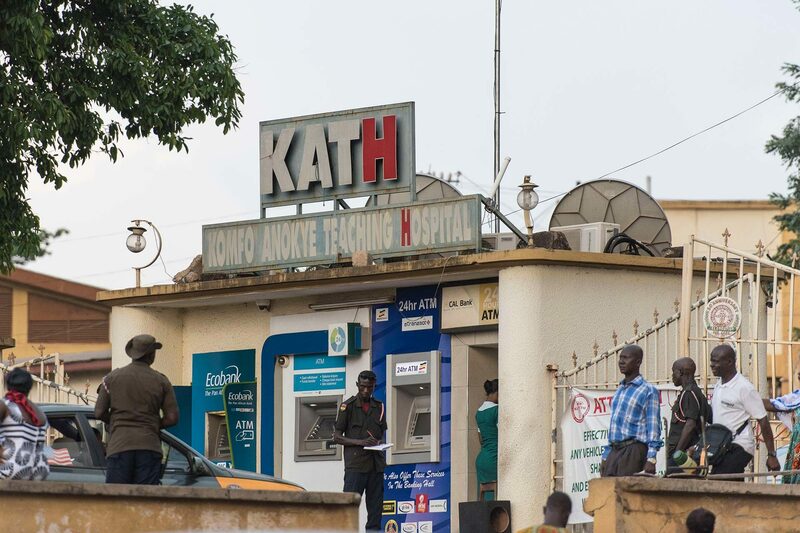 The ambitious new partnership between KATH and U-M aims to create a program that will train doctors in Ghana and eventually throughout West Africa to treat the most common cases. 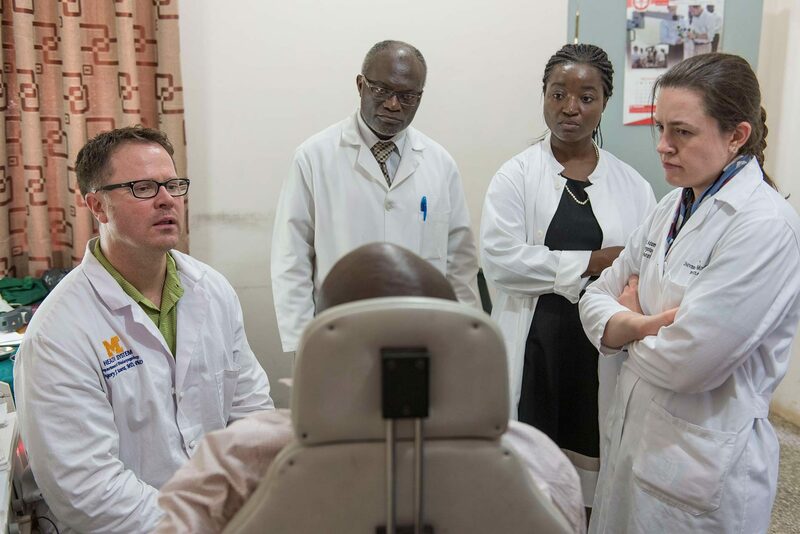 The collaboration in Kumasi—Ghana’s second-biggest city—has the potential to make a huge impact on the lives of thousands of people tormented with ear pain that is routinely treated in the West. Obeng might be one of the first beneficiaries. 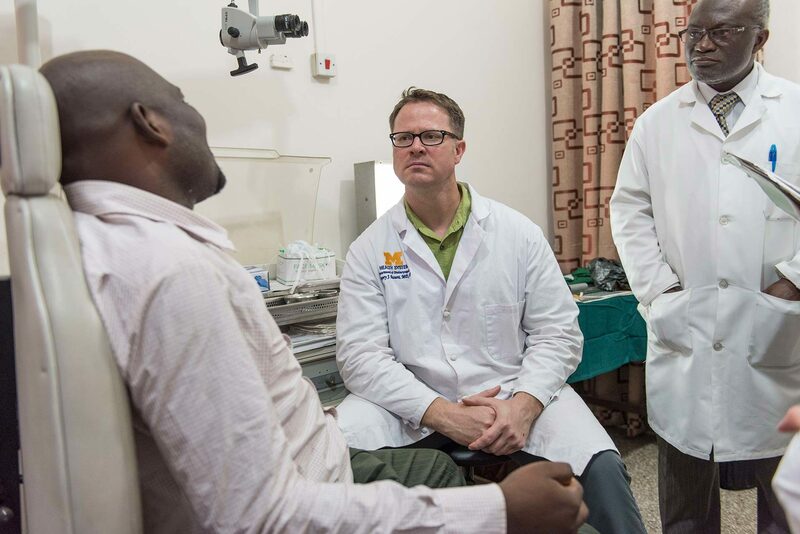 The first U-M physician Obeng meets is Greg Basura, a neurotologist who treats neurological disorders of the ear. He is dressed in a white doctor’s coat and running shoes with lime green trim. His broad chest and massive biceps give away one of his favorite hobbies: weight lifting, along with boxing and yoga. He’s far from the family farm in Boise, Idaho, where he raised goats and showed them in 4-H competitions. The special bond he developed with the animals prevents him from eating one of Ghana’s most popular dishes: goat stew. Basura has also been to Kenya, and this is his second trip to Ghana in a year. 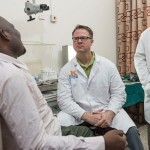 Last March, he and the U-M team brought microscopes and drills to KATH and helped set up a new center for doctors who want to practice their surgical techniques, drilling through temporal bones, which form part of the side of the skull and enclose the middle and inner ear. After checking Obeng’s ears, Basura says, “I’d like to do a test that will make you feel weird.” He then asks a nurse to bring a basin in case Obeng vomits again. Placing his hands on the back of the patient’s head, Basura slowly tilts it downward. After a couple of seconds, the doctor stops. The slight movement stimulates Obeng’s sense of balance, causing him unbearable discomfort. 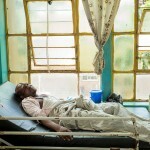 The Ghanaian doctors have diagnosed Obeng with Meniere’s disease, and Basura agrees. The illness causes a buildup of fluid in the compartments of the inner ear, or labyrinth, which contain the organs of balance and hearing. This leads to extreme vertigo and tinnitus—or ringing in the ear. Why certain people are cursed with the disorder is unknown, and it is difficult to study because it comes and goes. There’s no known cure. 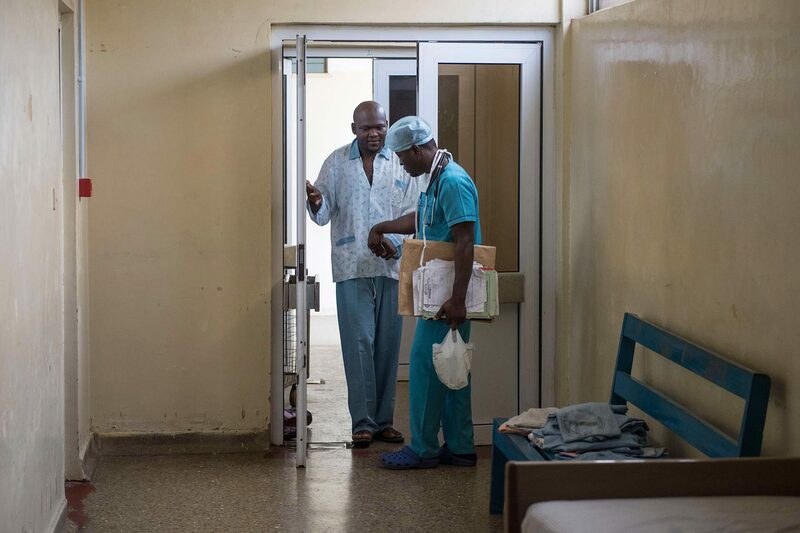 To stop the vertigo, surgeons will have to drill into Obeng’s inner ear and remove the labyrinth—a procedure the Ghanaian doctors are keen to learn. He’ll lose his hearing in his right ear, but that would happen anyway if the condition went untreated. 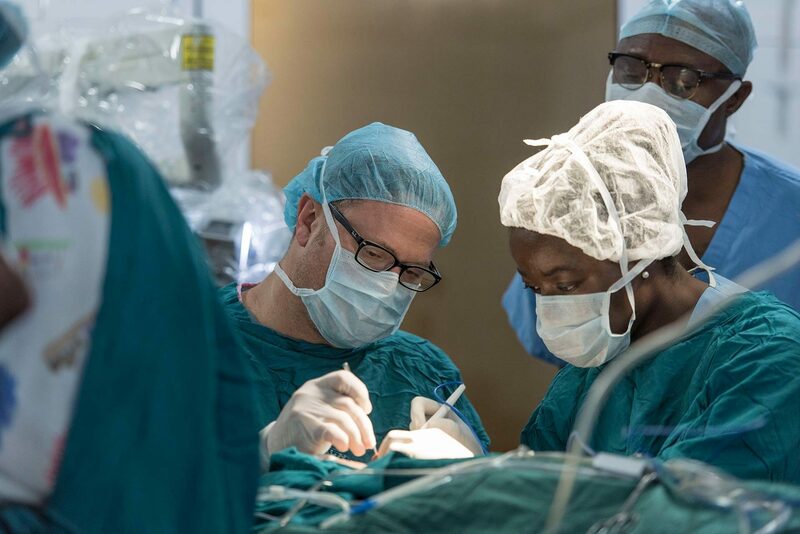 Obeng’s name gets penciled in on a list of candidates the U-M and Ghanaian doctors are considering for surgery later in the week. But whether his condition will be stable enough for surgery is uncertain. 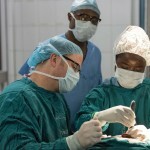 Many countries are in need of surgical training. 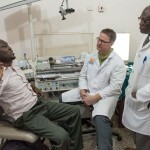 Why did the U-M doctors pick Ghana? It’s a former British colony that is slightly smaller than Oregon in size. The country’s name means “warrior king” in the Mende language, spoken across West Africa. It was the first sub-Saharan country in colonial Africa to win independence. Kumasi is in south-central Ghana and has a population of 1.2 million. It’s the former capital of the Ashanti Kingdom, which rose up in the 1700s and grew rich and powerful trading gold and slaves. Millions of Africans passed through Ghana’s ports as they were shipped to the U.S., Latin America and the Caribbean. 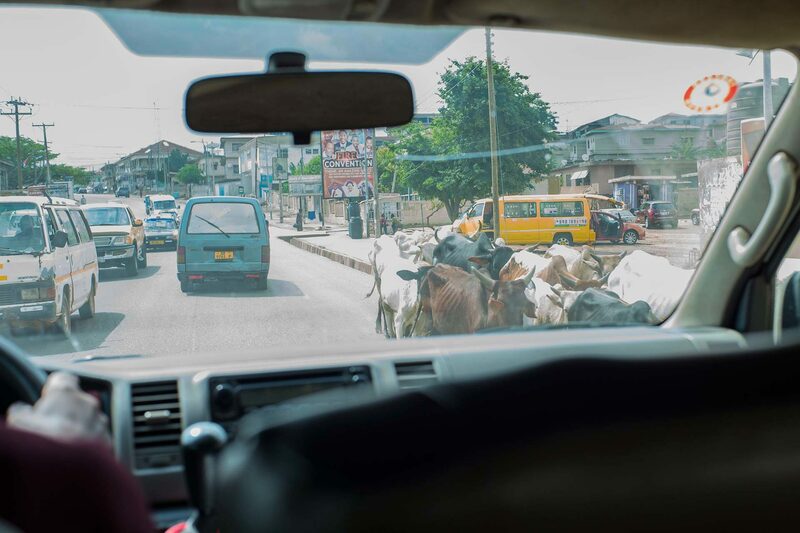 Now, Kumasi’s streets are congested with banged-up Toyota Corolla taxis, minibuses and sometimes herds of cattle. Sidewalk hawkers display coconuts, bags of peanuts and shampoo under multicolored umbrellas. The acrid scent of trash fires fills the steamy air. Two years ago, when the Department of Otolaryngology-Head and Neck Surgery at U-M was looking for a place to start a new collaboration, KATH was deemed an excellent potential partner. Built in the 1950s, the 1,200-bed KATH is a sprawling institution of low-rise concrete buildings painted in yellow and pink pastels. Red-flowered shrubs line the walkways, many of which are covered for shelter from rain showers and the blazing afternoon sun. A small herd of goats wanders around the outskirts of the complex, munching on grass and twigs. 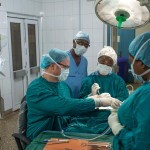 Prince emphasizes that he and the two other physicians on the trip are not part of a “medical mission.” Their main goal is to work with the doctors in Kumasi to establish a program to train Ghanaian otolaryngologists along with head-and-neck surgeons, who will eventually train medical students, residents and eventually other doctors from West African countries. Such a training program will be much more cost effective—and have a longer impact—than a traditional “medical mission” that flies in doctors for a few days, treats a few patients and goes home, he says. Another key factor that made Ghana attractive was U-M’s long involvement here. It began nearly 30 years ago when Tim Johnson, professor and chair of U-M’s Department of Obstetrics and Gynecology, was beginning his career. A colleague who was planning to give a presentation in Ghana had to cancel the trip when he caught the flu. Johnson agreed to go in his place and fell in love with the country and its people. 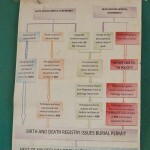 This was 1986 when Ghana had only five OB-GYN doctors in the entire country. The government was trying to train more by sending them abroad, but few were coming back. The key to halting the brain drain was offering training and other ways for doctors to advance their career at home. 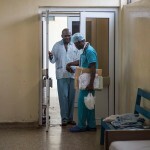 Johnson worked with two medical schools in Ghana to create an OB-GYN training program that has been wildly successful. 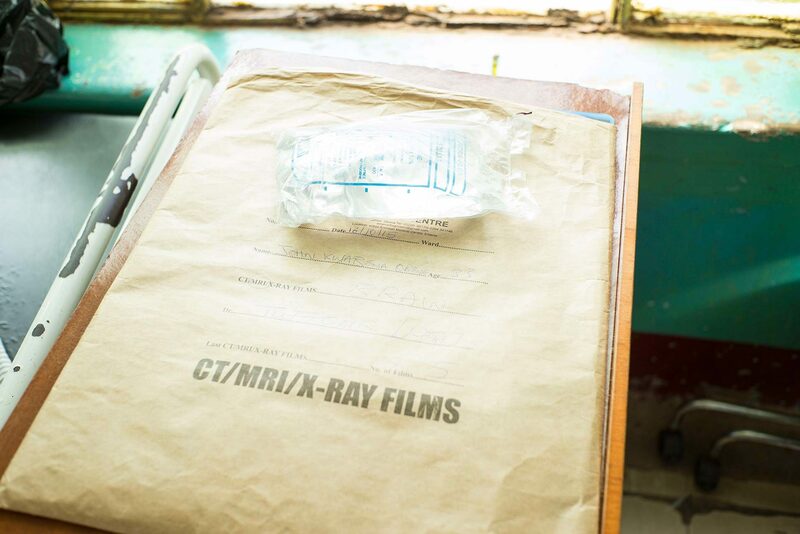 From 1989 to 2013, 142 doctors have been trained and 141 of them are still in Ghana. 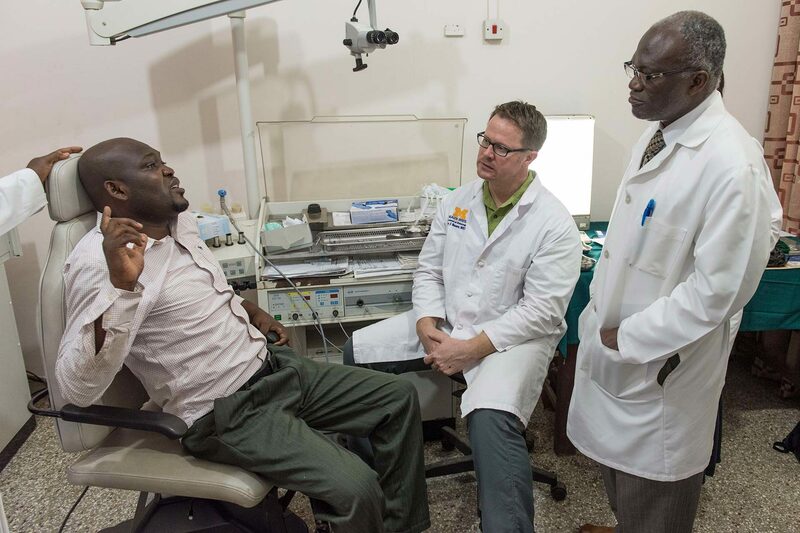 For the U-M otolaryngologists, they will know they’re successful at KATH when they are no longer needed, says Jeff Moyer, the third physician in the group visiting Kumasi. 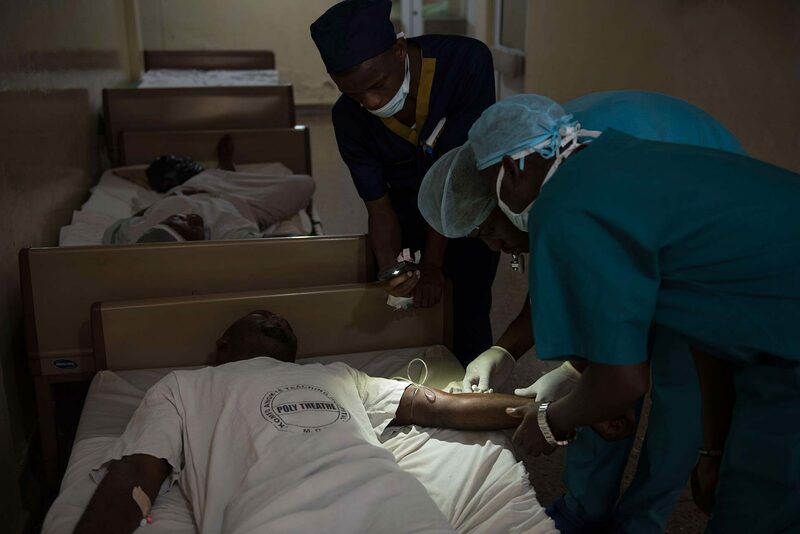 Two days after his exam, Obeng—still in the now-unbuttoned, vomit-stained dress shirt he wore to the clinic—is sprawled across a bed with a bare foam mattress upholstered in cracked black vinyl. Paint is peeling off the white walls of the large ward, and ceiling fans strain to take the edge off the afternoon heat. 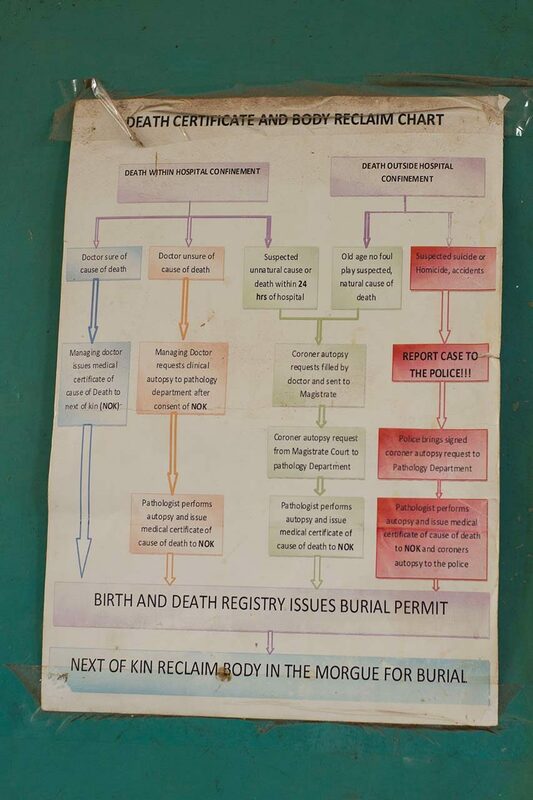 A small poster on a pillar tells patients’ families how to obtain a death certificate and reclaim a body. 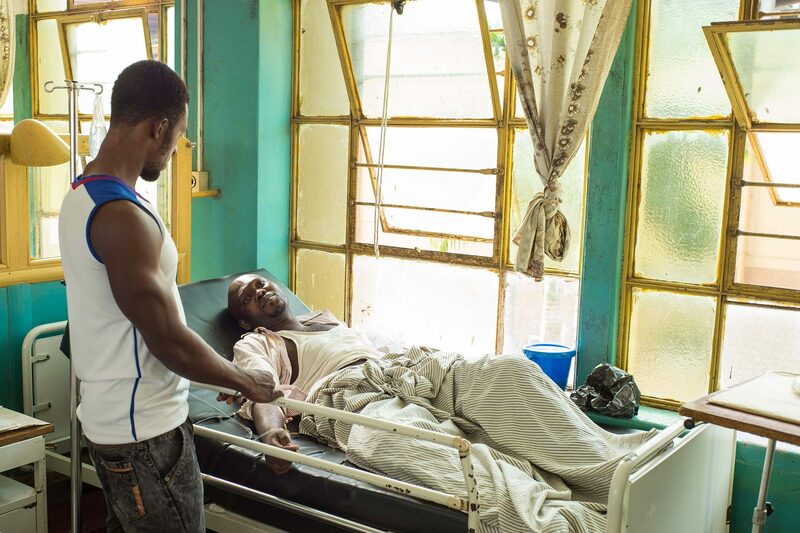 With the head of his bed propped up slightly and an IV in his right arm, Obeng complains softly that he is still weak, dizzy and nauseous. A small blue plastic pail sits on the windowsill to his left because he still can’t keep his food down. As he tells the story of his life, he gazes into the distance with heavy-lidded eyes, looking like a hopeless man beaten by this awful illness. He grew up in Kumasi, the son of a civil servant. He stayed behind when his father retired and the family left the city to farm millet in the north. He lives alone. When the severe vertigo began three years ago, Obeng was working as a pharmacy technician. The dizzy spells—or drop attacks—came without warning. Obeng says he hasn’t been able to work for a year and lost his rented home. 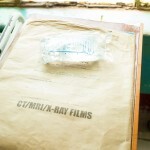 With his father now blind, his family was unable to help him, so he relies on charity from his church and friends. 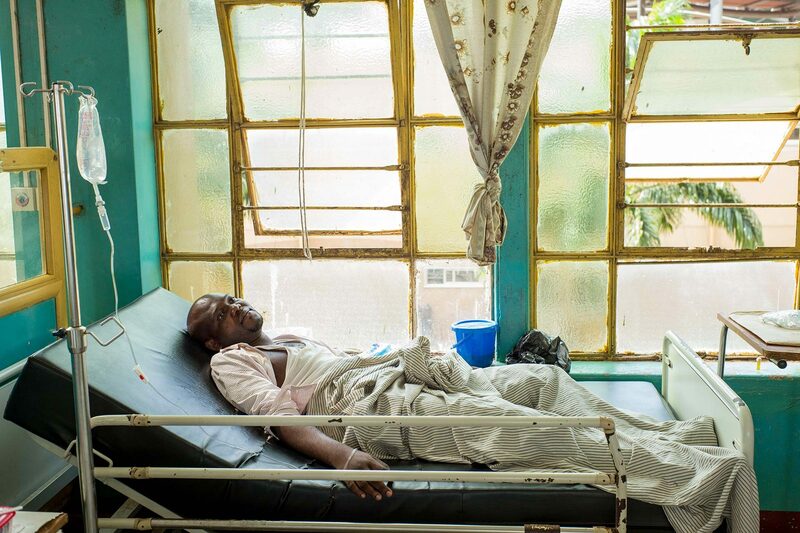 Obeng had heard that U.S. physicians were planning to visit Kumasi, but he didn’t know when. 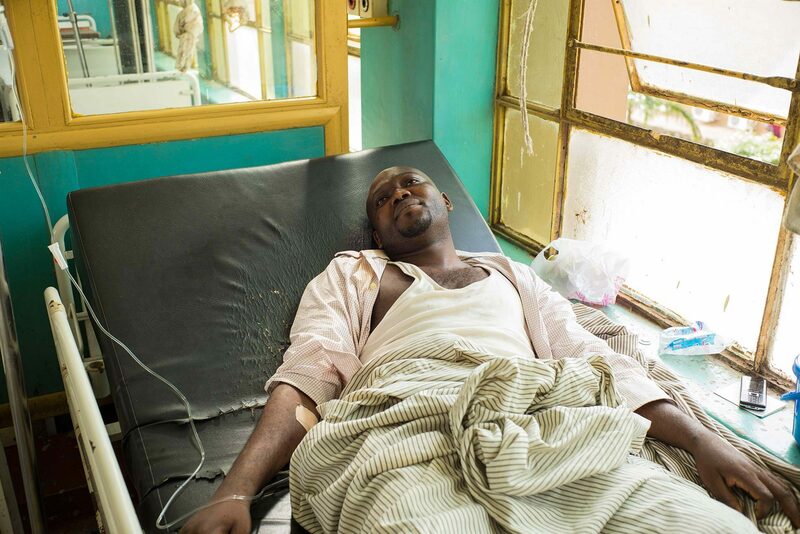 The morning he set out for the clinic, his plan was to get a check-up from his own doctors. But as he was waiting for a taxi, he had another drop attack. Showing up at the hospital just when U-M doctors were screening patients for surgery wasn’t dumb luck or serendipity in Obeng’s mind. He believes it was an act of God, whom he had been asking to relieve him of his misery. “I was just praying that if it’s time for me to go rest, God, please call me,” he says. The doctors still need to check him one more time to confirm he will be fit enough for surgery the next day. Obeng prays some more. Typical of West Africa, Ghana is home to 26 million people, but the country has only between 20 and 30 practicing ENT physicians. U-M Health System alone has 35. Few children have their hearing regularly screened in Ghana. Many ear infections go untreated and contribute to hearing loss. This year, the World Health Organization reported that 360 million people—5 percent of the world’s population—have disabling hearing loss, with half of all the cases avoidable with primary prevention. 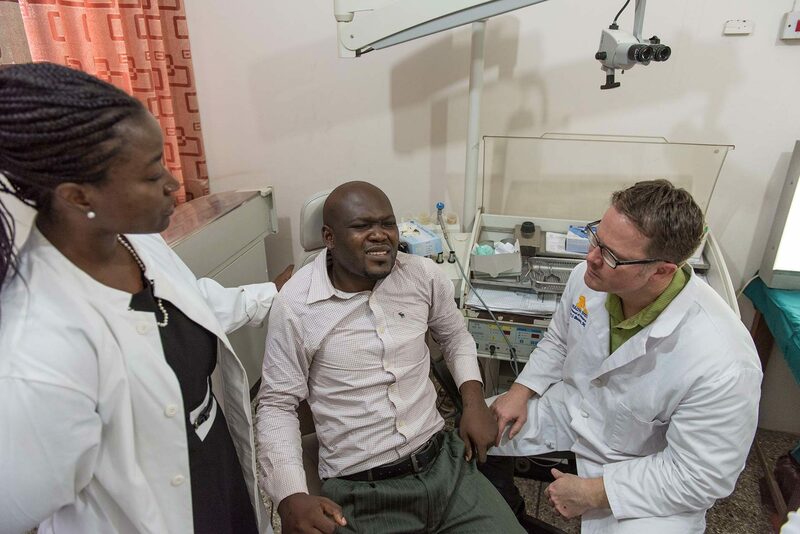 In many ways, caring for ears is a luxury in low-resource countries, said Issahalq Duah Mohammed, an otolaryngologist at KATH. 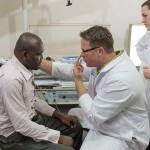 360 million people – 5 percent of the world’s population – have disabling hearing loss. Half of all the cases are avoidable with primary prevention. Duah is one of the two young physicians working with the U-M doctors to expand his surgical skills. 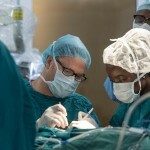 He went to medical school in Turkey and has traveled to South Africa, U-M and the University of Pittsburgh to observe ENT physicians perform surgery. 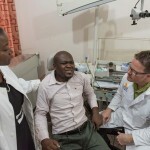 “When you go to these centers, you begin to appreciate the yawning gap in knowledge between ENT as it is practiced in the U.S., Europe and in Ghana,” he said. Ear surgery requires sophisticated instruments—without them, it’s easy to hurt somebody because the target area is so small. 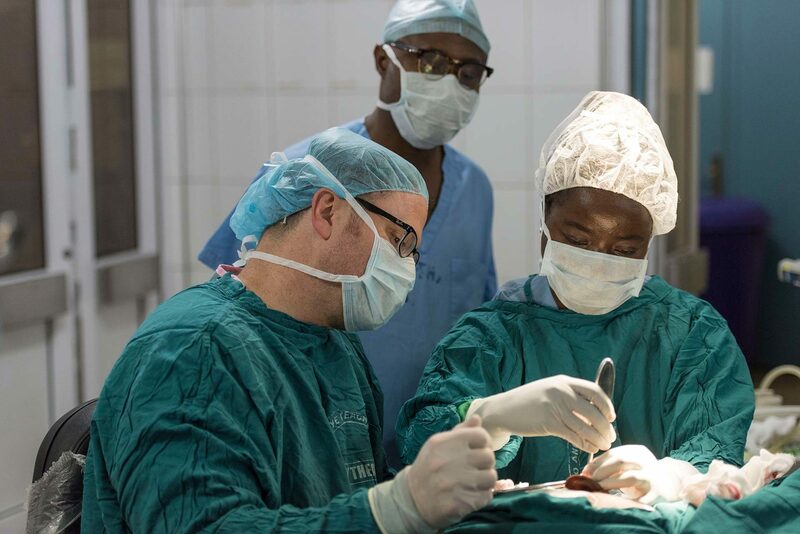 In past procedures, Duah has used a hammer and chisel to break through the skull to get to the inner ear—a method most U.S. surgeons stopped using decades ago. He said he is going to refrain from doing it again while he learns more advanced techniques. 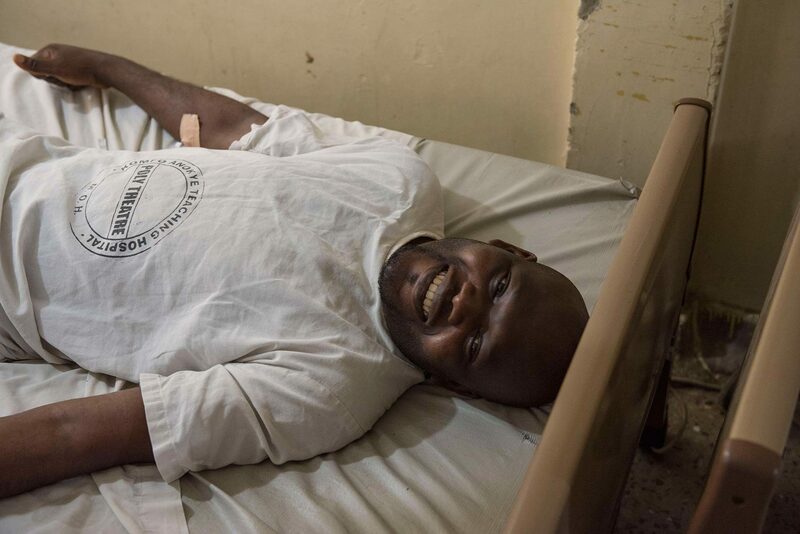 A smiling Obeng gives the thumbs up sign as he lies on a bed in a hall outside the operating room. He made the final cut for surgery. “Today, I feel good. I’m excited,” he says with the bright eyes of a man now thinking more about living than dying. The hallway is dimly lit, so a staffer pulls out his phone and uses the flashlight app to search for a vein for an IV. 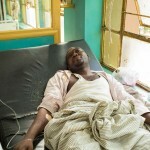 Obeng clenches his teeth and shuts his eyes in pain as his arm is jabbed a couple times until the IV slips in. 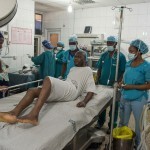 He shuffles barefoot into the operating room with medical staff holding his hand. The room is clean but dated. White tiles cover the walls, and the floor is brown sealed concrete speckled with black, white and coffee-colored bits of stones and shells. The surgeons sit on battered office chairs. The plan is to drill into Obeng’s inner ear and destroy the source of his agony—the labyrinth, which looks like three hollow Cheerios that have gravity sensors which help maintain balance. It basically tells your brain where your head and body are in space. U-M neurotologist Basura and his Ghanaian colleague Rita Larsen-Reindorf plan to extract Obeng’s labyrinth with a special drill. It’s a tricky procedure and a lot could go wrong. They will drill close to the brain and also need to be careful not to hit the facial nerve, which could paralyze the patient’s face. Larsen-Reindorf has a warm smile and wears her hair in intricate braids. As a medical student, her only exposure to otolaryngology was a one-month rotation, and it didn’t leave much of an impression. So her original plan was to specialize in obstetrics or anesthesiology. But after medical school, a visit with an ENT she met as a student changed her mind. She witnessed the doctor examine a 4-year-old girl who was brought in by her grandmother who said the child had extremely bad breath. The stench was so bad that kids in the neighborhood shunned her. The doctor told Larsen-Reindorf that she was 90 percent sure that something was stuck in the girl’s nose. The physician explained to Larsen-Reindorf that ENTs see both children and adults, treating some conditions medically and others with surgery. The variety appealed to her. 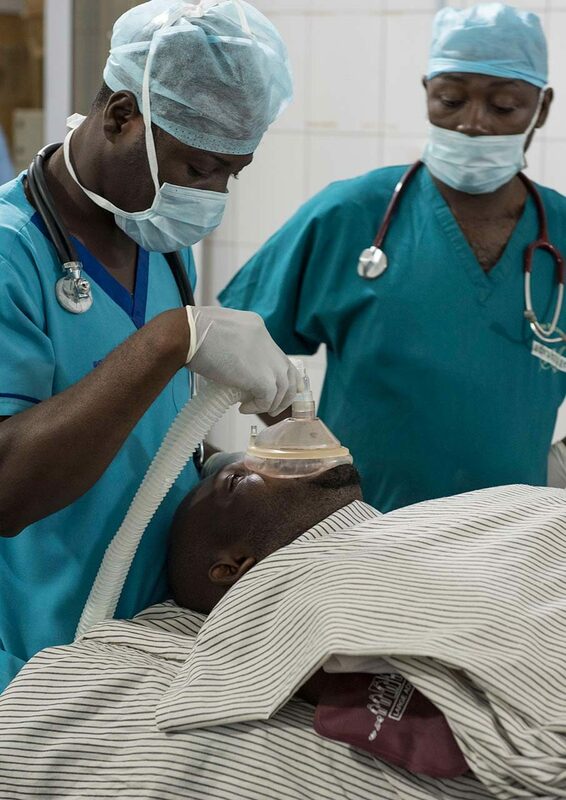 It doesn’t take long to anesthetize Obeng, and the surgeons make a crescent-shaped cut that curves around the mastoid bone—the bump just behind the ear. 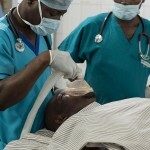 The incision allows the surgeons to peel the outer ear forward so that they can get to the mastoid. “The anatomy is a little funny there, so you have to be careful,” Basura tells Larsen-Reindorf as he patiently coaches her through the surgery. After they remove layers of tissue over the mastoid, they prepare to drill through the mastoid bone, a honeycomb structure that ventilates the middle ear. Basura uses a felt-tip pen to outline the part of the bone that will be removed. The drill the U-M doctors brought with them looks like a large pen with a long drill bit that ends with a cutting burr—a ball with sharp fluted blades. Looking confident and steady, Larsen-Reindorf—who has spent a few weeks at U-M learning to use the drill—grinds away the mastoid’s shell with a stroking motion, the drill in her right hand and the suction in the left. The white honeycomb is revealed. Basura takes over to show Larsen-Reindorf a few points on technique. As the surgeons drill out the mastoid, the hole they create is shaped like a cone that will provide a better angle for their instruments when they go into the inner ear. Larsen-Reindorf takes over again so that she can have a better feel for what it is like to go deep. They’re already several centimeters into Obeng’s skull. Within millimeters of the labyrinth, Basura asks his team to double check they’re on the correct side. “Once we go into his inner ear, there’s no turning back,” Basura says. He takes over and drills in small circles until he reaches the labyrinth, which has a white milky color. The drill breaks it up; suction removes the bits. “This ear is no longer serving any purpose for him,” Basura announces. There’s no need to plug the hole they created. The surgeons simply pull the outer ear back to its original position and Larsen-Reindorf stitches up the wound. The entire operation takes about two hours. 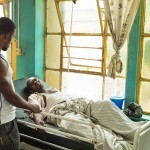 It doesn’t take long for Obeng to wake up, and Basura visits him in a recovery room. 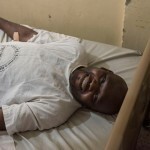 The patient says he feels OK, and when Basura asks him to smile, Obeng grins—a sign that his facial nerve wasn’t damaged. A day later, Obeng greets visitors with a fist bump. He’s wearing a clean pair of white pajamas decorated with a pattern of lizards, leaves and birds. A gauze bandage that looks like a big white ear muff covers the right side of his head. His eyes are half open, but he has a big smile on his face. He still feels discomfort and nausea, but he knows this is normal. His brain will need about 72 hours to calm down and compensate for the missing balance sensors on his right side. Some physical therapy also lies ahead. He’s eager to get back on his feet and start supporting his family again. After a busy week, the doctors reflected on next steps. Basura acknowledged that a large and regular presence of training physicians will be needed as the partnership solidifies. The U-M doctors will try to recruit physicians from other institutions to get involved in the program. Much of the burden will be on Larsen-Reindorf. She understands she could be a pivotal figure in the medical history of Ghana and the rest of the region. Success builds on success. 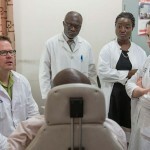 Support the Otolaryngology-Head and Neck initiative in Ghana with a gift.